Asian-American caucus members (from left): Representatives Tackey Chan, Keiko Orrall, Paul Schmid, Rady Mom, and Donald Wong. The five state representatives gathered in Tackey Chan’s State House office one recent morning had seemingly little in common. Two were Republicans, three were Democrats. One was a woman, four were men. Some had spent their entire lives in Massachusetts; one fled Cambodia as a refugee. What had brought them together was their Asian heritage — a heritage that, until very recently, has been largely non-existent on Beacon Hill. 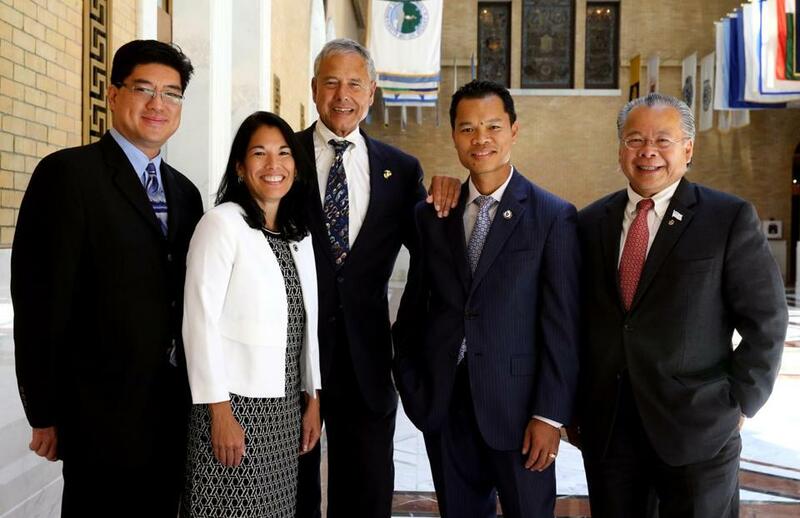 Together, the five legislators — Chan of Quincy, Rady Mom of Lowell, Keiko Orrall of Lakeville, Paul Schmid III of Westport, and Donald Wong of Saugus — compose the State House’s first Asian-American caucus. As discussions of race and representation have captured public conversation, the caucus has quietly made history. The legislators are working across partisan lines to connect state government to Asian-American constituents who are unfamiliar with, and wary of, a political system that has long left them on the sidelines. Nationwide, just 1 percent of all state legislators are Asian, even though Asians make up 5 percent of the national population, according to the National Conference of State Legislatures. Having enough legislators for a Massachusetts caucus “really is a landmark moment,” said Leverett Wing, who worked as a top aide to former Senate president Tom Birmingham for more than a decade. Wing said legislators were so unaccustomed to seeing Asians in the State House in the 1990s that one once asked him to vacuum the carpets. Yet for its historic significance, the caucus has garnered relatively little attention. Several activists in Boston’s Asian-American community were not aware of its existence. It is difficult to assign the caucus a birthdate; members announced its existence to their fellow representatives in 2011, but no public declaration existed until this May, when the members published a joint opinion piece in the Patriot Ledger of Quincy for Asian-American Pacific Islander month. The caucus members say they don’t want fanfare. But for a group with the mission of bringing more attention to underrepresented people and issues, the subtle approach may seem paradoxical. Representative Russell Holmes of Mattapan, chairman of the Massachusetts Black and Latino Legislative Caucus, acknowledged that his group has forgotten to include Asians in discussions about health care disparities among minorities, although many of the same issues apply to Asians as to blacks and Latinos. Still, the caucus’s plans don’t necessarily demand showy activism. Their goals are modest, yet pivotal. Their first priority, Chan said, is collecting data on Asian-Americans. Such a goal is not only achievable and important — it’s also largely nonpartisan. That’s key for a group split along party lines. Wong and Orrall are Republicans, with Orrall recently elected as the state’s Republican national committeewoman. The others are Democrats. And caucus members’ votes on the House floor often reflect their party. Yet the caucus members insist their political differences have no effect upon their ability to advocate for Asian-Americans. “Relationship-building is the most important thing in politics, [and] good friendships,” said Orrall, who said she texts silly cartoon images to her fellow caucus members. It may help that Asian-Americans’ common interests, such as data collection, aren’t politically polarizing. Chan rattled off what his Asian constituents ask him for: help accessing government services; a guide to local nonprofits; a basic explanation of Massachusetts’ political framework. Large-scale political consciousness among Asian-Americans is still just taking hold. Asians have the lowest voter registration and turnout rates of any ethnic group nationwide, according to the Center for American Progress. Chan, Wong, and Schmid, Massachusetts’ first Asian-American state representatives, weren’t elected until 2010. All caucus members said they spend a significant amount of time just explaining to their Asian-American constituents what their job entails. “State representative” doesn’t translate well to Chinese, Chan said. “I’ll say it to my Chinese constituents, and they’ll look at me, like, what does that really mean?” he said. As a result, political observers agreed that the group’s bipartisan nature is unlikely to be an obstacle, at least not yet. As Asians’ political presence increases, said Wing, the longtime State House staffer, the issues on which they press their legislators may become more contentious. He cited affirmative action as a burgeoning source of disagreement among Asian-American voters. For now, the caucus’s very existence is an achievement, one that has fostered not only political collaboration but also friendship. Non-Asian legislators have jokingly requested to join the caucus because of the group’s shared love of food, Wong said. Their collaboration packs a powerful visual punch, too. On April 13, led by Mom and the caucus, the House celebrated Khmer New Year for the first time. At one point, the five Asian-American members stood together at the front of the chamber to celebrate.